Hi all! I have a SUPER busy day, so no time for 7 Quick Takes unfortunately (ironic that those posts usually take me longer than others to write. ;-)) But I wanted to briefly remind everyone who wants to pray the St. Anne novena that it begins TODAY. 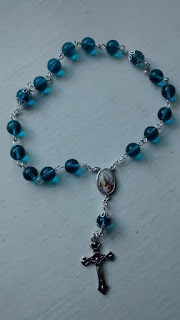 AND, in exciting news, when I arrived home yesterday, my St. Anne chaplet was waiting for me! 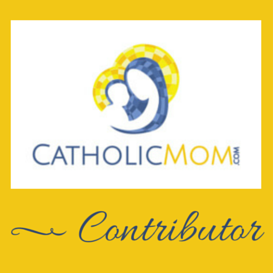 I'm going to put this video on the St. Anne novena page too, for easy reference. Yay for novenas! I have to rush off, I have a leviathan of a meeting later *insert super unhappy emoticon here* and so time is tight. BUT, I have lots of fun posts slated for next week. Remember, I'm dancing this weekend, and I already feel sick to my stomach thinking about the fact that I have a solo in the set. Public event, July heat, windy conditions, a shaky, sweaty-palmed, nervous belly dancer wielding a sword...what could go wrong?! I'll tell you all about it next week. ;-) Plus, I have more amusing knitting project tales, and my sister is potty training her twins and I thought maybe I'd write a "best of" potty training compilation post to boost her spirits. Want to join in? Come back next week! !